Rotator cuff injuries are incredibly common and it is helpful to figure out which of the four muscles is the major source of the problem (there is of course the possibility that multiple ones are injured/irritated). 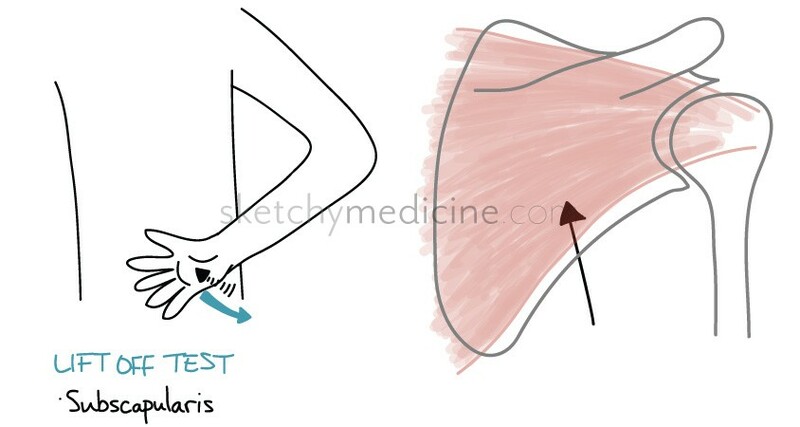 For the subscapular (innervated by the suprascapular nerve C5,6) you can test internal rotation of the arm. 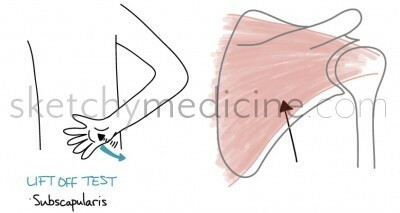 The patient places the dorsum of their hand on their lower back. The examiner then pushes on the hand while the patient tries to lift the hand from the lower back. Pain or weakness is a positive test. This entry was posted in Anatomy, Ortho, Rheumatology and tagged MSK, physical exam, rotator cuff by Ali. Bookmark the permalink. Subscapularis is supplied by subscapular nerve. Not the suprascapular nerve.